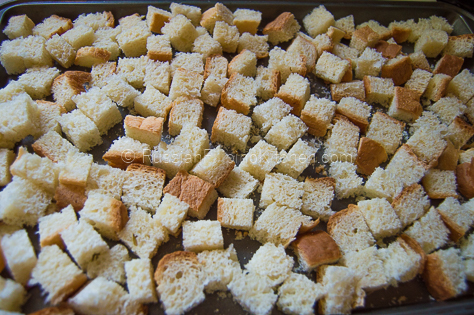 I first heard the word “croutons” and actually tried it when I moved to the US from Philippines some time ago. A week after I got here, my husband and I were invited over for dinner at one of his friend’s house. The host prepared a delicious American meal which included a Caesar salad. Of all the foods that were served, I was drawn to the salad the most. I got curious how yummy it was and so interesting how a green salad could have some cubed toasted bread in it! 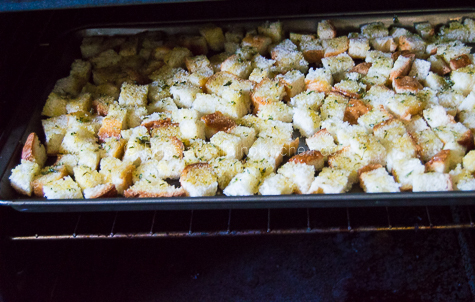 From where I came from, we never make salad that way and also never made croutons. 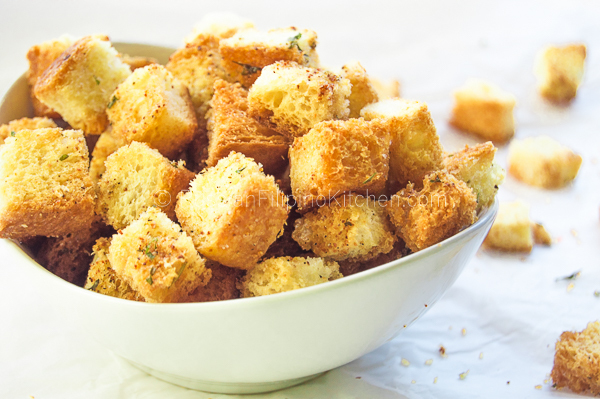 For my fellow Filipinos who have no idea what “croutons” are, they’re basically just re-baked bread cut into cubes, lightly brushed with cooking oil or melted butter, and seasoned with some spices. They’re great for salads, soup toppings, and just perfect for snacking (my favorite!). 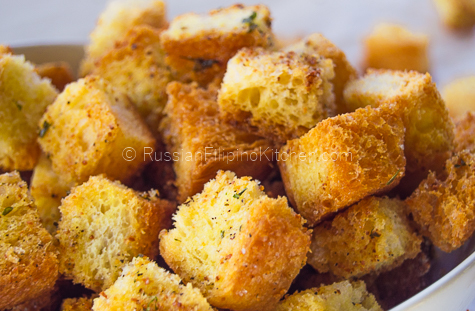 This is a quick and easy croutons recipe. I make this at least once a week with our leftover bread mainly for the kids to snack on. 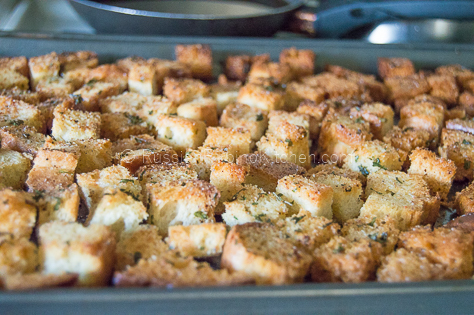 It’s a great way to put any stale bread to good use without throwing it away. It’s home-made so it’s guaranteed to taste much better than store-bought and also much healthier. 2. 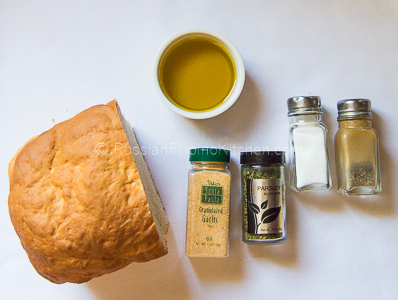 Slice bread into desired thickness. I usually slice it about ¾ inch thick and cut it further into cubes. 3. Arrange on a single layer on a baking sheet. 4. In a small mixing bowl, combine the rest of the ingredients. 5. 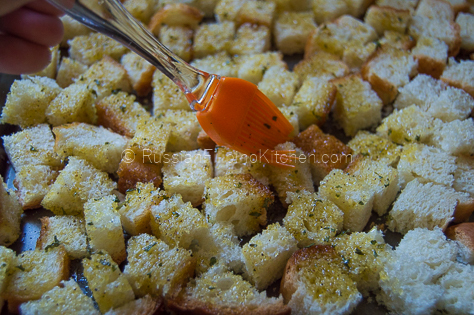 Use a basting brush to coat mixture onto croutons evenly. 6. Bake in the preheated oven for 10 minutes until golden brown and toasted. 7. Allow to cool and serve. Store leftovers in an airtight container to retain freshness and crunchiness. Slice bread into desired thickness. I usually slice it about ¾ inch thick and cut it further into cubes. 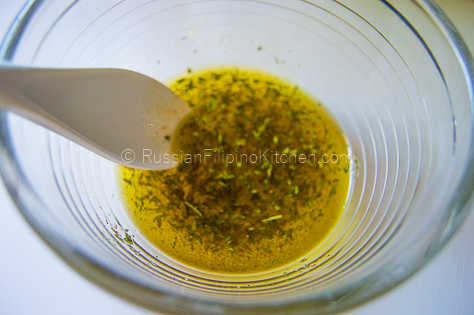 In a small mixing bowl, combine the rest of the ingredients. 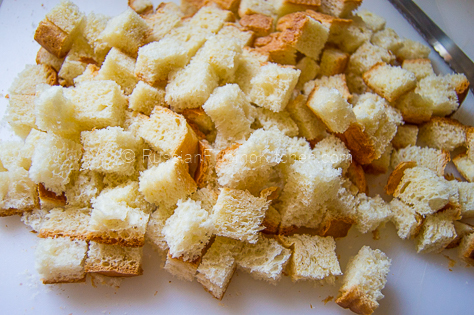 Use a basting brush to coat mixture onto croutons evenly. Bake in the preheated oven for 10 minutes until golden brown and toasted. Allow to cool and serve. Store leftovers in an airtight container to retain freshness and crunchiness.